How is the opening price of a share determined? The Indian stock market works for 5 days from Monday to Friday. The normal trading session is between 9:15 AM to 3:30 PM in both the major stock exchanges of India- BSE, and NSE. However, before the normal trading session, there is a small pre-opening session from 9:00 AM to 9:15 AM every day. This is the period when the opening price of the shares is decided. But what happens during this period? And how is the opening price of a share determined? This is what we are going to discuss in this post. How is the opening price of a share determined? But before we discuss it, there are few basics that you need to know first. Also read: Stock Market Timings in India. Market Order: It is the order when the stocks are bought/sold at the market price and is executed instantaneously. 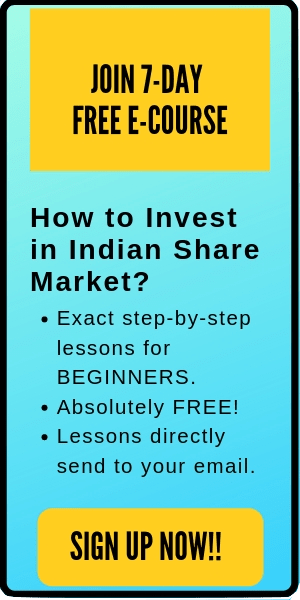 For example, assume that you want to buy 10 stocks of a company is currently trading at the market price of Rs 90. When you place the market order, you will buy the stocks at market price i.e. Rs 90. Limit Order: This order refers to buying or selling the stocks at a limit price. For the same example stated above, let’s assume that now you want to buy the stocks at Rs 88. Then you can place a limit order and once the market price of the stock falls to Rs 88, the order is executed. Market order is instantaneous whereas limit orders occur depending on the fulfilment of supply and demand. The pre-opening session is divided into three segments- Order collection period, order matching period and buffer period. Let us understand each one of them in details now. 9:00 AM to 9:08 AM – This session is called Order Collection period. You can place, modify and cancel your order during this time period. However, no execution occurs during this period. 9:08 AM to 9:12 AM – This is called order matching period or trade confirmation order. You cannot place, modify or cancel your order during this interval. Placed orders are executed during this period based on the price identification method. This is also called equilibrium price determination or Call auction. 9:12 AM to 9:15 AM – This period is called buffer period and is used for easy transition from pre-opening session to normal market session. The opening price of the share is determined during the call auction. As soon as the order collection period is over, order matching period starts. Eligible ‘limit’ orders are matched with eligible ‘limit’ orders. Residual eligible ‘limit’ orders are matched with ‘market’ orders. ‘Market’ orders are matched with ‘market’ orders. 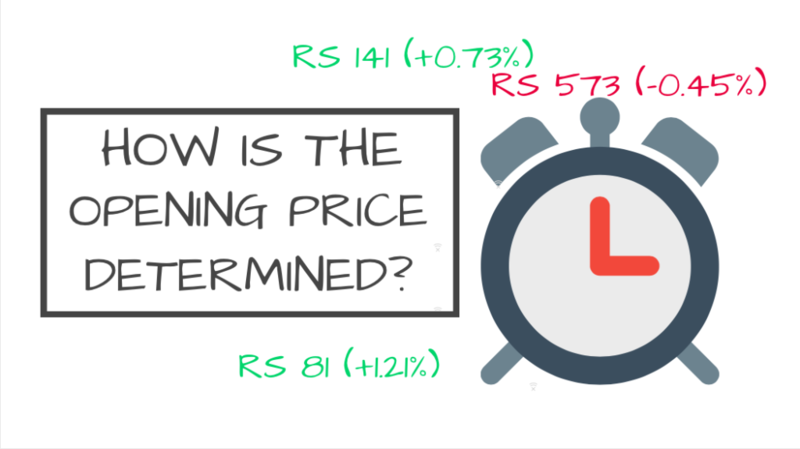 Now, let us understand how the opening price is decided with the help of an example. Assume that during the order collection period, following demand (buy orders) & supply (sell orders) were available for different stock prices for a company named ‘ABC’. I had customised a simple table for easy explanation. Here, you can notice that there are different quantities of demand and supply of stock for different share prices (based on the buy and sell order placed). The opening price is determined based on the principle of demand and supply mechanism. It occurs at the equilibrium price, where the maximum volume (tradable quantity) is executable. 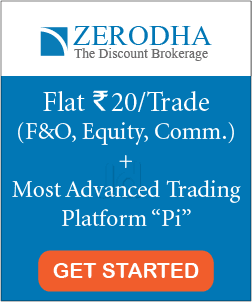 If the above example, the maximum tradable quality was possible at a share price of Rs 102. Hence, Rs 102 will act as the opening price for the share. All the outstanding orders, which are not executed in the pre-opening session, will move to the normal market session. Note: The above table is created in a simple way to let you understand the basics. However, in real time scenarios, there will be tons of volume of buy and sell orders, making it quite complicated. The equilibrium price determined in pre-open session is determined as the opening price for the share. That’s all. I hope this post on ‘How is the opening price of a share determined?’ is useful to the readers. If you have any doubts, feel free to comment below.